This isn’t your typical survival guide for typical kinds of disasters. 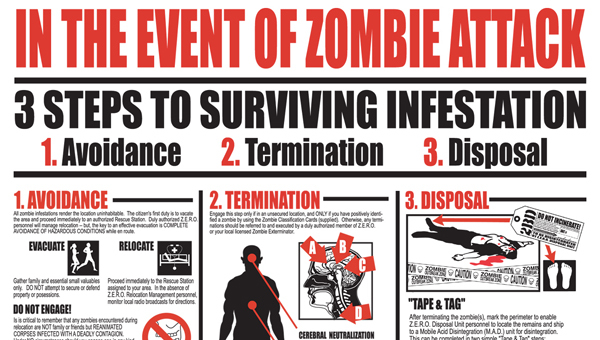 We might have a good idea of what to do in the event of a tornado, a financial collapse, or an epidemic, but zombie survival is different, and finally we have some resources to help. The simple black, red, and white coloring works to convey the sense of emergency, with an artistic style that fits with other emergency-related infographics (like the kinds you get on a plane). There is surprisingly little information to do with how to assess an individual after a bite, to know their odds of turning into a zombie, how to recognize symptoms, and what to do. Seems a bit careless to me, considering what we’re dealing with here. 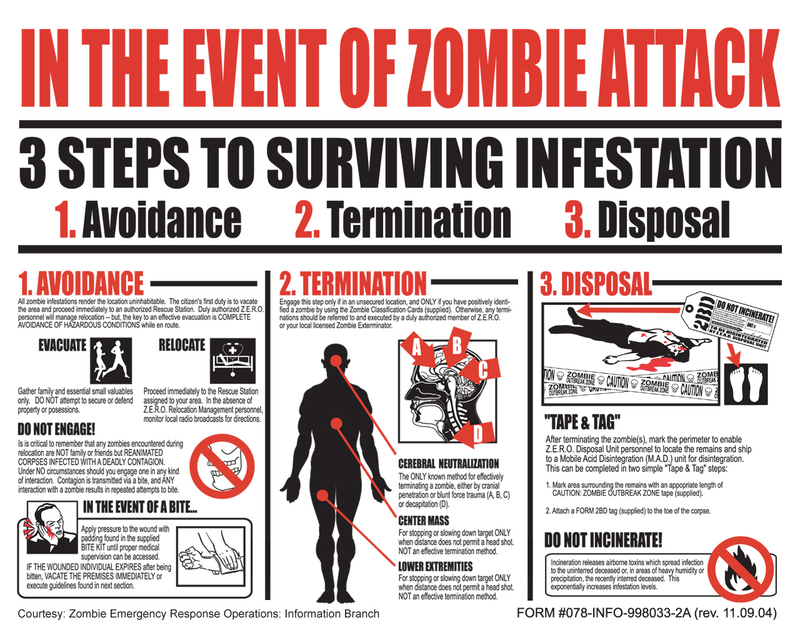 Despite it being a little heavy with the amount of text, this is far from a complete zombie survival guide. I know it wasn’t meant to be, but I would still rather have had more information, had topics introduced, or been pointed in the direction of more information. Useful weapons? How much punishment a typical zombie can take? Assessing what kind of zombie I’m dealing with? The infographic simply needs more. This entry was posted on August 25, 2011, 8:01 pm and is filed under Health & Safety. You can follow any responses to this entry through RSS 2.0. You can leave a response, or trackback from your own site.